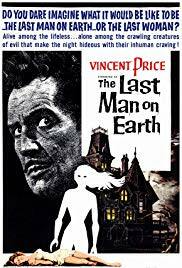 The Last Man on Earth is a 1964 Italian-American science-fiction horror film based on the 1954 Richard Matheson novel I Am Legend. The film was directed by Ubaldo Ragona and Sidney Salkow, and stars Vincent Price. The script was written in part by Matheson, but he was dissatisfied with the result and chose to be credited as “Logan Swanson”. William Leicester, Furio M. Monetti, and Ubaldo Ragona were the other writers.